The increase in the flows of asylum seekers towards the European Union in recent years has re-awakened the discussion over the meaning of European solidarity. 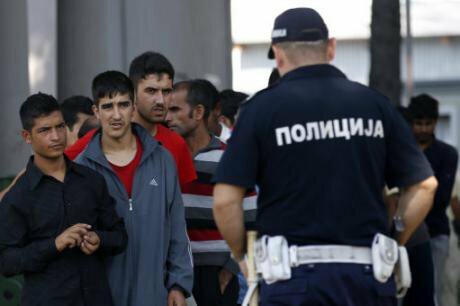 A Serbian police officer stands in front of migrants who wait in line for lunch in the transit centre for refugees in Sid, about 100 km west from Belgrade, Serbia, Thursday, Sept. 15, 2016. Paimages/Darko Vojinovic. All rights reserved. While there has been ongoing harmonisation of national rules on asylum procedure, reception conditions are refugee qualification, asylum applications in the EU are still examined by individual Member States following a national asylum procedure and leading to a national refugee status and ensuing rights. The presumption of mutual trust is inextricably linked with automaticity in inter-state cooperation. Automaticity in inter-state cooperation means that a national decision will be enforced beyond the territory of the issuing Member State by authorities in other EU Member States across the Area of Freedom, Security and Justice without many questions being asked and with the requested authority having at its disposal extremely limited- if any at all- grounds to refuse the request for cooperation.